For music & concert photographers, restrictions have meant it’s become harder and harder over the years to get those great shots. So seeing the Fujifilm XF100-400mm lens come into the fold is a very welcome addition to the Fujifilm lenses lineup. Along with bad photography contracts thrust upon us as we collect our photo passes, and image right grabs on the pictures we capture, we’re now being forced further and further back within a venue, which restricts what we can actually capture due to the distance we’re expected to shoot at. This makes the XF100-400mm essential to achieving good results. 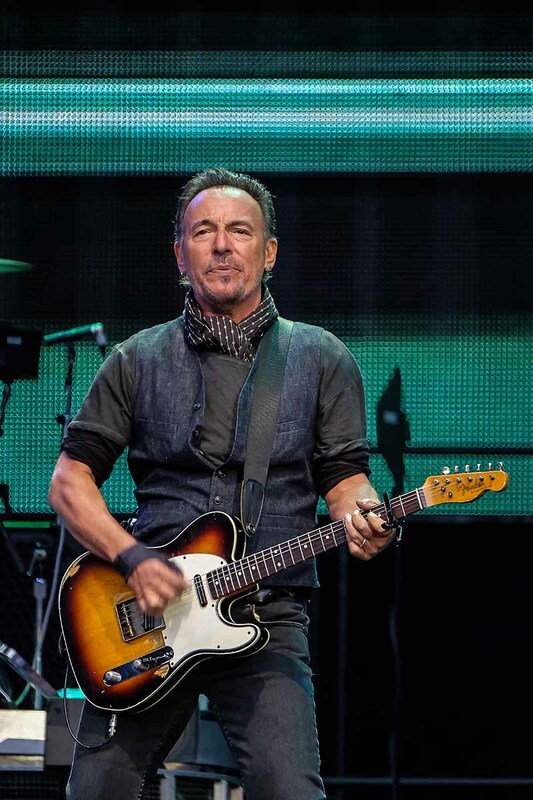 With Bruce Springsteen performing in Manchester, I looked forward to using Fuji’s new beast of a lens the 100-400mm. Even though we were expected to shoot from the ‘Golden Circle’ barrier at around 50 meters (164 feet) from the stage, it’s still quite a distance. The size & weight of this new lens was inline with all the Fuji X series cameras/lenses, well made, light in weight and weather sealed. The one thing that did concern me though as I arrived at the City of Manchester stadium was the weather…… It was absolutely pouring down. I knew this would be a good test for both this new lens and my Fuji X-T1 camera! Once in position, I had 3 songs in which to capture images from the ‘Golden Circle’ barrier. Even from here it was difficult to gain a vantage point above the sea of waving arms, mobile phones and homemade signs that swam through the crowd as Springsteen performed. Even though it is a larger lens than other Fuji lenses in their range, in comparison to Full Frame it’s still relatively light and having to shoot without a mono pod (as I was constantly moving to dodge the arms blocking my shot) I was able to do this and keep my camera steady without much shake. The camera and lens handled the heavy rain perfectly, no problems there, and I also found that the lens focuses very quickly and especially when Bruce was standing directly in front of the big video screen (which can be challenging for cameras). Once home and after a bit of time spent editing the pictures, I was extremely happy with how the 100-400mm lens performed. It helped me capture some great moments in the allotted 3 songs slot I was given to shoot in, and the distance the lens covers from 100mm to 400mm was a massive plus as right at the end of the third song Springsteen stepped onto the lower stage and I was able to capture that moment too! XF100-400mm Vs Bruce Springsteen posted on Fujifilm X Blog on June 22, 2016 8:20 am . July 7 :: Fujifilm Event also in Japan :: Fujifilm X-T2 Coming!